Discussion in 'Guides' started by Rydia, Aug 5, 2017. Even if the team is capable of killing the boss the fight will be a little slow and it has some RNG involved so if you plan to farm him is better if you wait a little, at least until you get some other good DPS to use instead of Velraine^ (like Snaip^, Grace^, Clara^, Shinen^.....) or an extra physical tapper. I will explain the different characters and teams that will make the farming easier at the end of the guide. Why to farm the Moon King (level 79). Because if you beat him he will drop some powerful Moon and Sun companions (the improved versions of Fire/Ice magic). As usual I recommend farming him with a 100L team. - To get the Sun companions you can just beat him with any team. - To get the Moon companions you should beat him with an 80/100L team. The Moon King spawns together with four adds. 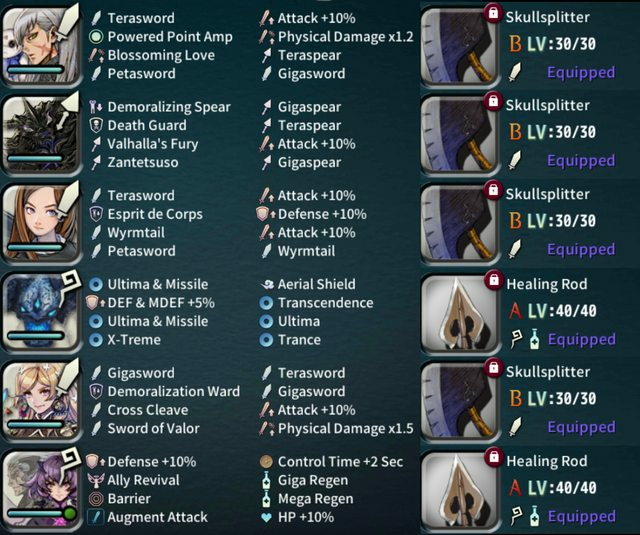 The boss has 1200k HP and different resistances to different types of magic, it will take 100% damage from Sun and 75% damage from physical and non- elemental magic. Since killing him using Sun magic will spawn a more powerful version of himself Moon King Level 99 . You want to kill him using a physical team. He will repeat the same attack pattern during the fight but will interrupted when the dragon HP reach certain thresholds. The boss attacks are pretty strong with a physical and magical component, and will mostly kill any of the members of our free team party with the exception of Suoh^ and Invincible^ when they have barrier casted on them. Except in very controlled situations we should remember which attack he is going to do each turn and avoid them. If you want to tank one of the boss attacks with Suoh^/Invi^ (with barrier) do it when there aren't adds and heal your units as soon as possible!!!! Help!!!! I keep forgetting the dragon attack pattern!!! 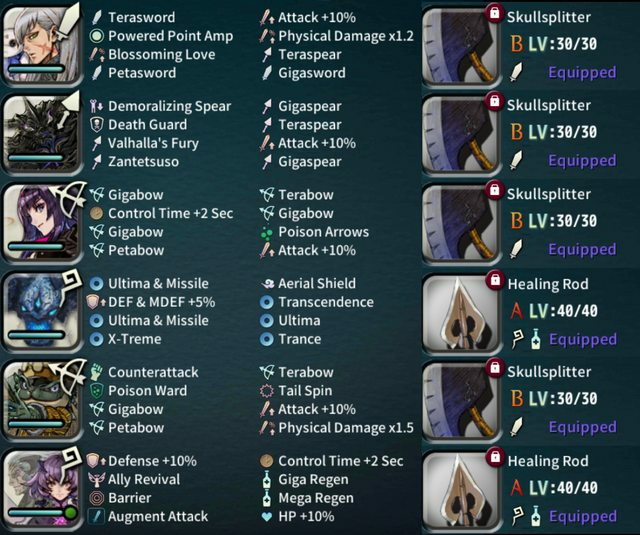 In case you have troubles remembering which is the next attack the boss will perform; here are a few tips. The red zone indicates the dangerous zone. As long as you stay away from the red cells you are going to be safe no matter which attack he does. -"The moonlight is shining down"
The dragon is charging his next attack. Devastating attack that will kill our party. Remember that even if bosses are "showed" as 2x2 cells the game takes the lower-left cell as the "boss real spot", you can see this easily when attacking bosses with Pincer (1) magic attacks. That means that when choosing which units are going to be affected by Lunacy the reference point is the lower-left corner of the boss. The debuff and its effects on the party will only last one turn so if you chain some unit by mistake but they don't get killed you can resume the normal pattern next turn. Turn 1: Summon Warpholes: If you move a unit over one of these traps it will disappear from battle a few turns so you need to be careful to avoid them. This will make harder to pincer the boss or any of the mobs in the last turn. Turn 2: Moonlight Sphere!! !, All: This is a devastating attack that will kill your entire party. After he summons the Warpholes you have an extra turn to pincer or hit him with areas (if he is at 1 HP) and finish him before he can cast Moonlight Sphere and kill your party. A good way to deal with the Warpholes if you are having troubles with them is bringing Shin'en. If you got Bahl as a starter you can farm the dragon using only free characters + Bahl^. 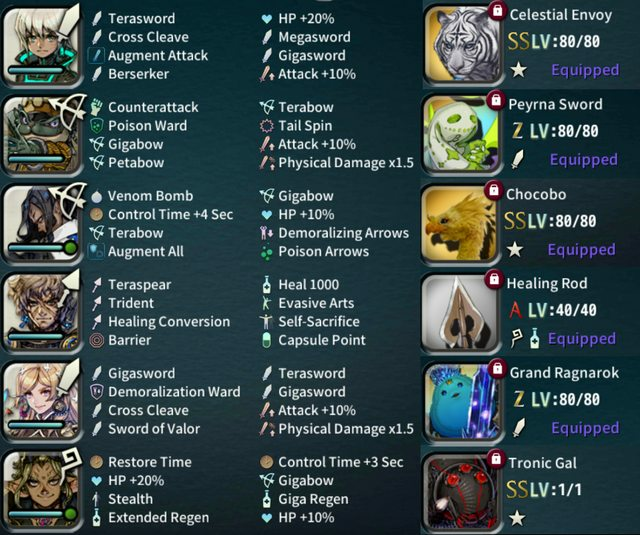 If you don't have Bahl^ continue reading for an alternative team with Grace^ + Snaip^. Of course if you have Bahl^ + Snaip^ use both of them. I have cleared the dragon at least 5 or 6 and with different situations, early burst or suboptimal burst, failed pincers, so the team can clear it with an acceptable consistency, of course the more you rush the more you risk and you are more likely to fail. - First turns are probably the harder because the dragon starts the battle with 4 adds, you have 3 turns to kill these before he summons more. - Each turn avoid the dragon attacks, always kill the adds first. - After you kill the adds you will have 1-2 turns to focus on the boss so deplete his HP. - He summons more adds, kill them, then continue depleting the dragon HP. Save at least 2 PowerPoint's. - At 75% and 50% HP he will cast Lunacy on 3 party members. DONT PINCER or CHAIN this members, just make them stay away from the boss attacks. After one turn they will be back to normal. - Continue depleting the boss HP until he is close to 300K. Use all your Taps + Physical impairs and double pincer him using a Power Point. Remember Odin^/Suoh^ + Velraine^/Bahl^ (Bahl^ and Suoh^ are always the 2nd pincer). Much better if the pincer is horizontal, even better if you can use some add to do a triple pincer. - Now he summoned Warpholes. Pincer him again with a PP to finish him (or use some areas if he is really close to death). If you don't kill him he will cast Moonlight Sphere and kill your whole party. - Kill any adds that could have been left. Alternative team for Grace starter. And yes at the end of the video I show a valuable lesson about WHY WE HAVE TO KILL THE ADDS FIRST !!!! Rushing is never good! If you have both Bahl^ and Snaip^ , for a better team you can use Suoh^ Snaip^ Bahl^ as physical attackers, the 4th character can be either a 2nd physical tapper, Shinen^ , Grace^ ........or Odin^ if we don't have anything better. This being said if you still feel you want more healing you can bring someone like Amina^/Amisandra^ BUT be careful with the Extend Chain during Lunacy attack, you don't want to chain affected units by mistake!!! ¡¡¡That's the base of the team you don't need anything else!!!! - Damage reduction: Invincible^ barrier if you are using the farmable team. If you have Olber^ use him instead of Invincible for much easier runs. - More physical damage!!!. The more damage dealers you have (physical attackers or extra physical tappers) the shorter the fight and safer burst. - If you have Shinen^ with his OII he can also be a good addition to your team thanks to his Impair Skill (for the final burst) + Warphole Immunity (to finish the boss and the adds in the last turn). Example of an ideal Team with Olber^ + 2 Tappers. Now I'm going to show an example of what would be an "ideal" team. This is the team I used to farm Moon King myself and makes the fight really easy. The credits for the team go to @Silver_Mitsuki who gave me the exact composition and skills he was using. - Damage reduction: Olber^. The combination of Capsules, Self Sacrifice and Evasive Arts allowed me to mostly ignore all the adds and at the same time tank the boss attacks with most of the units making the fight much easier and relaxed. Mr45, NazT N8, Chrismesco and 5 others like this. A good tip is that the King is always in a position where you can double pincer it without getting hit. So if he's in the sides, he's going to do row attack. And if he's in the center, he's going to do either column or hollow attack. Tharos and Rydia like this. if you know the pattern...the battle of sun/moon king is easy. Good job rydia two thumb for you. I only have run it with 100L and I got my moons pretty easily so cant help you there. Can u build a team with 100L? 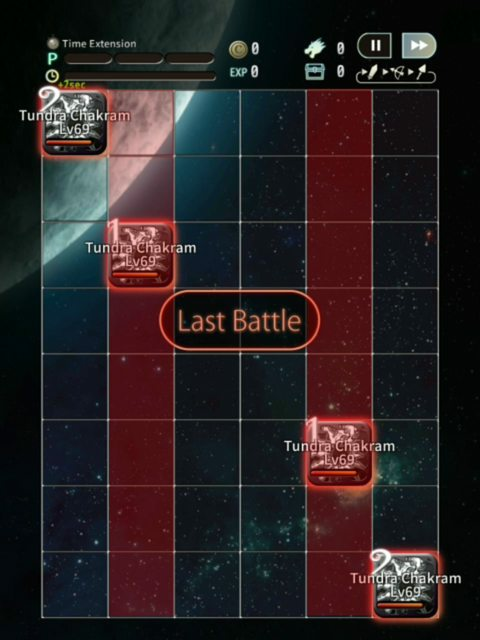 In my current moon king team the lowest luck chars are BhalZ with 75 luck and OlberZ with only 27. I can take it to finish Bahl but don't think I will have the courage to finish OlberZ. Others are GatzZ, SuohZ, Peyrna and Shin'en all 100 luck. EDIT:managed to kill it with AminaZ, Mizell^ and Invincible^. In fact I find it easier than using Bhal and/or olber as I can add some sun king companions and the enemies takes pretty big damages from non-elemental magic. Thanks! I was inspired by your dragon king teams guide for this swap. Ironically through, I got my first moon king companion after 2 100 luck runs on a... 80 luck chest. So to answer my first question:got the companion on a 80 luck chest after around 15 tries. For some reason I was superlucky and only needed ....3-4? runs of Moon King to get the 2 moon companions i needed for Sun King. I just did a third run with the 100 luck team and got a second moon king otomo on the 80 luck chest. As if using a full luck team increase the odds of getting one in the 80 luck chest. Anyway, time to see if I can take the sun king now! On the 'Olber /\ method', i lack Schweitz and Gego. Can i replace Schweitz with Palpa? And what would be a good replacement for Gego? A ct+4 mover or Echo? Korin is amazing here. I went from "Bahl dies in 2 Breath Attacks" to "Bahl consistently surviving". Also Palpa with Tronic Gal is absolutely wonderful. Thats a perfect example of alternative teams you can use!!!!! Moon king allows a lot of flexibity, the reason I put Grace + Snaip as my example is because those are 2 silver characters and added a list about how to tailor your own teams. In your team you are using 2 tappers (1 golden and 1 rainbow) + 1 physical impair, and lot of High Level companions so a much harder to get team than one asking for 1 silver character. Most people will have Snaip or Macuri before getting extra tappers so I just showed the "cheaper team". What Im curious now is why you used that team. You managed to pull Schweiz before getting Snaip? Not sure if you are extremely lucky or very very unlucky xD I guess the first run you did it without the SunZ ¿? i managed to pull schweiz before i pulled snaip^. I could recode snaip, but then I have to sb him again (and lose 40% free SB)... i like to play, sb and lb my team at the same time. Currently I am playing with Bahl^ with 45%SB and ~10LB, therefore i change the team (bahl out, grace in) to get 100LB chest drop (and moon king dropped on first try with that team). For me the cheaper team is that, what I pulled / currently have without loseing my current progress in silver road. If you look at the player base, there are always the new ones (just silver and a few rare characters) and the whales (got a lot of rare character). But I am between. I got some nice Z characters/otomos but I miss a few decent ones (OLBER where are you???) and want to complete silver road, so I have to build other teams and not recode everything. I would say "if you have 3 tappers 2 good damage dealers (like suoh/grace/clara?/odin?) and one supporter" you could also create a farming team, because dmg dealers and tappers are not that specific information and people like me could build teams more quickly. Ok thats a good explanation of why you dont have Snaip^ yet. I still consider him one of the most important characters of the game and you surely want to have him at 100L so even if you pulled his golden form you would end LBIng him so I think you would be actually doing yourself a favor if you recode your current Snaip, even fi you have to LB him again after you are gaining some extra luck for the recode without using any energy. I wouldnt do this with all the characters of course because as you say you would be losing progress. But Bahl and Snaip are imo the 2 silvers that is worth to do this. Havent done it yet. But i am curious. Do you think Sun King will be possible with Moon Companions, Feno and maybe a magic attack tapper? Or is sun king Full-Team-only like mutoh?